Figure 1a. Wood substrates produced from different tree species can have different chemicals present in the wood that can be toxic to young plants/seedlings. All photos by Brian E. Jackson. Traditional soilless substrate components have been researched for many decades (mostly since the 1960s) and their problems and potentials have been thoroughly explored and understood. For example, peat’s hydrophobicity, bark’s inconsistency, coconut coir’s salt/electrical conductivity (EC) variability, compost’s reproducibility, dustiness of perlite, etc. Yet, these materials work and are the backbone of containerized horticulture production. Now that wood products are becoming more popular, there is a tremendous need for research, data, and exploration into their problems and potentials. Nomenclature of products can sometimes get confusing, even in the growing media world. When we discuss wood substrates, we are talking about the actual xylem (yellow/white) wood material, not the bark (brown/dark exterior of trees). Bark and wood are very different parts of a tree, each with different functions, chemical properties, and physical properties. Research on tree species suitable for substrates has been conducted on several dozen species to date. These trials have shown that the wood toxins vary by tree type (hardwood vs. softwood), tree species within the same genus, location of tree growth, time of year when harvested, etc. 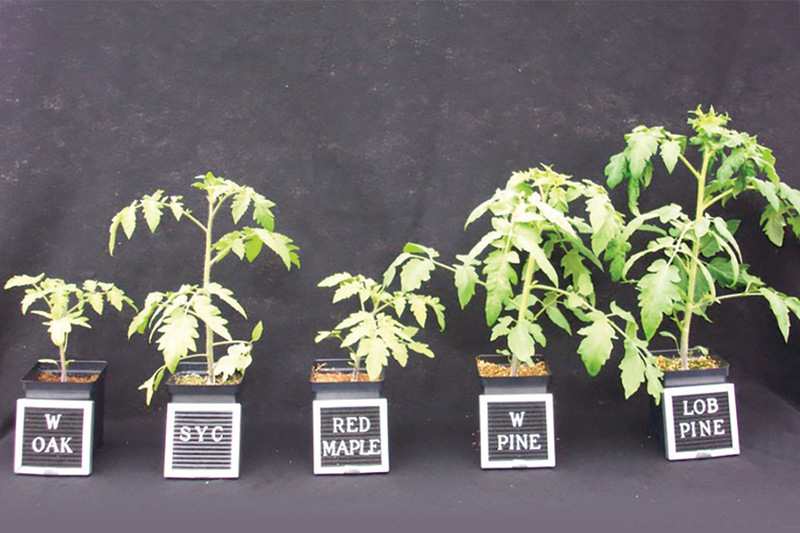 Many sensitive crops have been tested in wood substrates derived from different tree species including tomato, marigold, impatiens, and radish due to their sensitivity to toxins and their responsiveness to growth-retarding symptoms (Figure 1, see slideshow). This information is extremely important for anyone who wants to source their own wood materials and make their own wood substrates. Research and observations over the past 15 years have seen a variety of fresh wood (green wood) toxicity occurrences in various horticultural crops, mostly with seedlings and young herbaceous plants. To overcome these fresh wood toxins in hammer-milled pine tree substrate, efforts have been made to eliminate, reduce, or overcome these issues. Charcoal is a known chemically active binding agent/material, so it has been added to freshly processed wood substrate, but the results were sporadic and inconclusive at the time the trials were conducted. We have also steam sterilized (a common practice in the past for many soil and substrate products) wood materials, conducted leaching experiments during crop production, aging, and storage experiments over time, and layering/blending with peat and other materials (Figure 2, see slideshow). To date, the two best (some evidence of repeated success) approaches for someone milling their own pine tree substrate (with hammer mill or like machine) are to: 1) mill the wood and store in super sacks, in/under closed shelter for a few months prior to use; or 2) if using fresh/green wood at some percent in your substrate, make sure to adjust irrigations so that leaching can be achieved at every watering (at least initially). Many of the wood toxins have been proven to be soluble and will leach out of the containers. 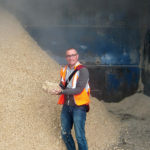 Storing/aging the wood chips before milling is also a possible strategy, but little is currently understood about these methods. Using fresh wood substrate can indeed be a problem for growers if it is not managed correctly, but it can be done. The issue with green wood must be properly and thoroughly understood and resolved because the production of wood substrates with a hammer mill is the cheapest and most independent option for growers making their own substrate. Some of the commercial wood fiber manufacturing equipment generates heat or has heat introduced as part of the wood chip de-fiberizing process (Figure 3, see slideshow). The heat, either in the high temperature/pressure water bathing solution phase or in mechanical friction stages of wood chip processing, can range from 212ºF to 300ºF) and has the ability to remove or reduce some chemicals found in fresh wood chips. Some low molecular weight compounds are believed to be released (solubilized or oxidized) in the aqueous phase of fiber manufacturing in the case of thermo-mechanical equipment like twin-disc refiners. Also present in twin-disc refiners, as well as single- or twin-screw extruders (a second method of making wood fiber), is heat generation from friction. This friction helps produce steam during the process, and the steam is also believed to perhaps volatilize additional chemicals from wood chips. Some have stated that wood fiber produced with these methods is sterile. If wood is sterilized to some extent during the manufacturing process (nothing published on this), then once introduced to air, equipment, other substrate components, plant material, etc., it is certainly then not sterile. However, looking at various wood substrate material processing equipment, some with and some without heat, there is some strong subjective and observational data that suggests the heat does indeed reduce the wood toxins present in some substrate materials and lessen the phytotoxic effect on young plants when potted in wood-containing substrates. Much work needs to be (and is being) done on these and related topics. Generally speaking, wood fiber/chip substrates have a high carbon (C):nitrogen (N) ratio, are very low in EC, have an acidic pH, have very weak pH buffering capacity, and have very low cation (CEC) and anion (AEC) exchange capacities. Regarding the pH specifically, the inherent pH of processed pine wood has been reported to range between 4.8 and 6.2. This wide range is likely due to variations in season of harvest (pH in trees fluctuates depending on the season and sap flow) and may be due to tree age and location where the trees were grown. Pine wood has very little pH buffering capacity (Figure 4, see slideshow); therefore, pH can drift or be changed easily with small lime additions, fertilizers, irrigation water, etc. Standard/traditional liming rates for peat:perlite mixes should not be the basis for peat:wood mixes. As the percent of wood increases (by volume), the percent of lime addition should be lowered accordingly. Similar to pH, wood substrates also have a low CEC and have little if any ability to hold nutrients compared to other materials like peat, bark, or vermiculite. The higher the percent of wood in a mix, the less nutrient holding reserves one should expect in the mix. That coupled with nitrogen immobilization (to be discussed later in the series) requires growers to pay very close attention to crop fertility. Not all growers will see problems or face production challenges. The commercial products on the market today have had good results and grower feedback, and they are supported by technical grower experts to assist when/if problems arise. The non-commercial products or self-made wood materials are often where problems occur. Researchers are working overtime to address the many known challenges of using wood substrates in various production systems while also working to discover more of the unknown risks/issues of using these new substrate materials. We do not yet know as much about wood as we do about our traditional components, but we will in time. Brian E. Jackson is an assistant professor and co-director of the Horticultural Substrates Laboratory in the Department of Horticultural Science at North Carolina State University. See all author stories here.